Vascular endothelial growth factor (VEGF), produced by almost all tumor cells, affects the ability of hemopoietic progenitor cells (HPC) to differentiate into functional dendritic cells (DC) during the early stages of their maturation. In this study we demonstrate specific binding of VEGF to HPC. This binding was efficiently competed by placenta growth factor (PlGF), a ligand reportedly specific for the Flt-1 receptor. The number of binding sites for VEGF decreased during DC maturation in vitro associated with decreased levels of mRNA for Flt-1. VEGF significantly inhibited nuclear factor-κB (NF-κB)-dependent activation of reporter gene transcription during the first 24 h in culture. The presence of VEGF significantly decreased the specific DNA binding of NF-κB as early as 30 min after induction with TNF-α. This was followed on days 7 to 10 by decreases in the mRNA for RelB and c-Rel, two subunits of NF-κB. Blockade of NF-κB activity in HPC at early stages of differentiation with an adenovirus expressing a dominant IκB inhibitor of NF-κB reproduced the pattern of effects observed with VEGF. Thus, NF-κB plays an important role in maturation of HPCs to DC, and VEGF activation of the Flt-1 receptor is able to block the activation of NF-κB in this system. Blockade of NF-κB activation in HPCs by tumor-derived factors may therefore be a mechanism by which tumor cells can directly down-modulate the ability of the immune system to generate effective antitumor immune responses. An effective antitumor immune response is a potentially important factor in controlling the growth of tumors. The fact that tumors develop at all in immunocompetent hosts implies that an immune response either does not exist or is insufficient to prevent tumor development. Immune avoidance may be divided into two major aspects: features of tumor cells (expression of tumor Ags, defects in Ag presentation, low or no expression of MHC class I and II, etc.) that allow escape from immune system control and features of the host immune system that prevent detection/elimination of a neoplastic cell. Professional APC, in particular dendritic cells (DC),3 are critical elements of antitumor immunity induction. These cells are responsible for presentation of tumor-specific Ags and induction of an effective immune response. Defective DC function in tumor-bearing hosts has been described by several groups and could be a major factor responsible for defective immune function in cancer (1, 2, 3, 4, 5). The mechanism of this defective function is not clear. It has been suggested that tumor cells release factors affecting DC function (3, 6, 7, 8). Recently, we showed that tumor cells produce such factors inhibiting the functional maturation of DC from hemopoietic progenitor cells in vitro (9), and that a large part of this effect is mediated by vascular endothelial growth factor (VEGF). VEGF is 34- to 42-kDa protein produced by almost all tumor cells and responsible for the formation of tumor neovasculature (10, 11, 12). VEGF significantly inhibited the growth of myeloid progenitor cells in the presence of cytokines and growth factors usually sufficient for the normal growth of these cells (13, 14). These data indicate that VEGF signaling may alter hemopoietic progenitor cell (HPC) differentiation to DC. However, the mechanism of this effect remains unclear. VEGF may be directly binding to HPC to induce the observed effects or to another cell type that is needed for DC function or maturation. The responsible receptor and the molecular signal transduction mechanisms of VEGF action in this system are also unclear. A better understanding of these mechanisms may provide new insights into the process of DC differentiation and the development of immune responses in both normal and tumor-bearing individuals. Clarification of this mechanism was the purpose of this study. We and others have detected the presence of mRNA for one of the VEGF receptors, Flt-1, in human hemopoietic progenitor cells (CD34+ cells) (9, 15, 16). mRNA for another VEGF receptor, KDR, has also been reported in these cells by others (15). The detection of mRNA for a specific VEGF receptor suggests that VEGF may act directly on these cells, and in this study we report specific binding of VEGF to HPCs and implicate the transcription factor NF-κB in the observed functional effects. NF-κB regulates transcription of many genes involved in immune response, including cytokines and growth factors (reviewed in Refs. 17 and 18). NF-κB is present as an inactive complex in the cytoplasm of many cells bound to the inhibitory protein IκB. Activation of NF-κB involves serine phosphorylation, dissociation, and degradation of IκB followed by release and nuclear translocation of NF-κB. Alternatively, tyrosine phosphorylation of IκB may also result in its activation in the absence of degradation (19). This activation can be mediated by a variety of stimuli, including bacterial LPS, PMA, and TNF-α. Authentic NF-κB is composed of 50- and 65-kDa subunits that bind to a 10-bp motif in the promoter of responsive genes. Several subunits of NF-κB have been identified: p50, p52, p65 (RelA), c-Rel, and RelB. These subunits form both homo- and heterodimeric complexes and differentially regulate gene expression. Several studies have recently demonstrated that RelB, a component of NF-κB, is required for the development of DC (20, 21, 22). Here, we demonstrate for the first time that VEGF signaling via the Flt-1 receptor inhibits NF-κB activation in hemopoietic progenitor cells. This inhibition of NF-κB also leads to defective functional maturation of DC and may contribute to inefficient induction of immunity in cancer patients. CD34+ cells were isolated from umbilical cord blood by magnetic bead separation techniques (Dynal, Oslo, Norway) according to the manufacturer’s protocol. The purity of CD34+ cells was >90% as estimated by flow cytometry with anti-CD34+ Ab (Becton Dickinson, Mountain View, CA). 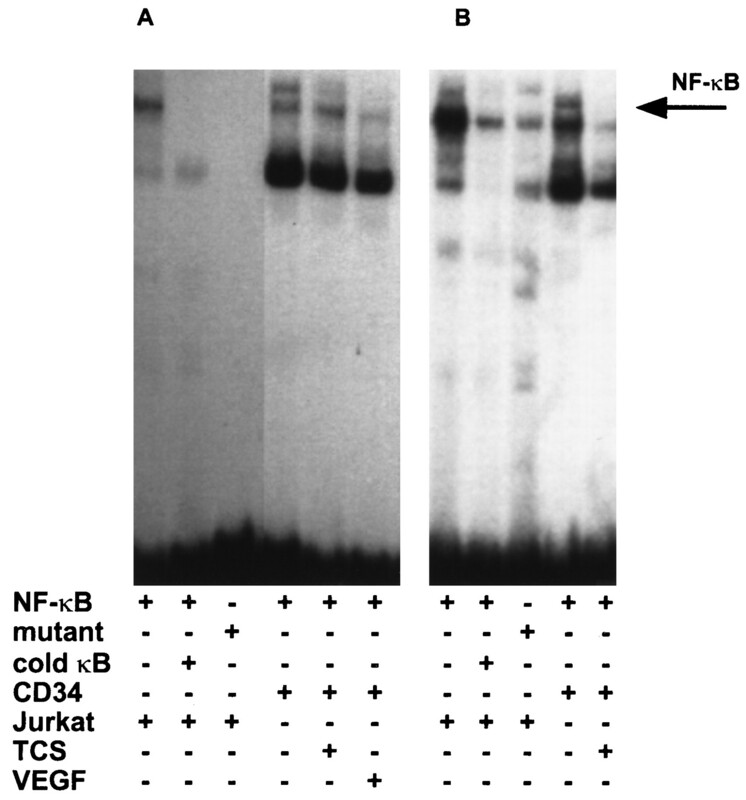 In some experiments with VEGF binding, CD34+ were separated on a FACStar flow cell sorter (Becton Dickinson) after labeling with anti-CD34+ FITC Ab. CD34+ cells (2 × 105) were cultured in 24-well plates in complete culture medium (CCM; RPMI 1640 supplemented with 10% FCS, 5 × 10−5 M 2-ME, and antibiotics; Life Technologies, Gaithersburg, MD) with 2 ng/ml GM-CSF and 1 ng/ml TNF-α or 2 ng/ml IL-4 and 10 ng/ml stem cell factor. All cytokines were obtained from R&D Systems (Minneapolis, MN). Tumor cell supernatants (TCS) were generated from different tumor cell lines as described previously (9). Tumor cell lines were obtained from American Type Culture Collection (Rockville, MD). Three cell lines, the most effective in previous experiments (HTB 130, HTB 131, and HTB 121) were used in this study. VEGF165 and VEGF121 were obtained from R&D. TCS (20% final concentration) or VEGF (50–100 ng/ml) was added on day 0. CCM with cytokines was replaced on days 5 and 10. TCS and VEGF were not added with fresh medium. For several experiments DC were sorted using a FACStar cell sorter (Becton Dickinson). Briefly, cells generated from CD34+ progenitor cells in the presence of GM-CSF and TNF-α were collected on day 14, washed, and labeled with either CD1a (RDI, Flanders, NJ) or HLA DR (Sigma Chemical Co., St. Louis, MO) mAbs conjugated with FITC. Dead cells were labeled with 7AAD (Molecular Probes, Eugene, OR) and excluded. Viable CD1a+ or HLA DRbright cells were separated from CD1a− or HLA DR− cells, collected, and used in some experiments. The level of nonspecific binding was established using FITC-labeled mouse IgG2b (Sigma). For some experiments DC were generated from precursors in peripheral blood as previously described (23). Briefly, mononuclear cells isolated from peripheral blood were cultured for 1 h on six-well plates in CCM. Nonadherent cells were removed, and the remaining cells were cultured in complete culture medium supplemented with GM-CSF (5 ng/ml) and IL-4 (2 ng/ml) for 6 days at 37°C. After that time cells were collected, and DC were further purified on a metrizamide gradient (14.5 g metrizamide (Accurate Chemical, Westbury, NY) dissolved in 100 ml of RPMI 1640 with 10% FCS). The purity of the final DC population was >90%. Iodination of VEGF was performed using the chloramine-T method. Briefly, 25 μg of protein in PBS was incubated with 1 mCi of 125I and 100 μg of chloramine-T for 3 min on ice. This was followed by addition of 60 μg of sodium metabisulfite and separation of free iodine on a Sephadex G-25 column. The sp. act. (10,000–15,000 cpm/fmol) was determined by measuring the total recovered protein using a Bradford assay, and total incorporated 125I was measured using a gamma counter (Beckman, Palo Alto, CA). VEGF radiolabeled to this sp. act. was fully functional as tested in an endothelial cell proliferation assay (data not shown). To measure specific binding, 3 × 105 CD34+ cells were incubated in duplicate with [125I]VEGF in PBS with 0.2% BSA for 6 to 8 h at 4°C. For the cold competition assay, cells were incubated with a 100-fold molar excess of unlabeled VEGF, GM-CSF, or placenta growth factor (PlGF). PlGF used in this study was either obtained from R&D or was provided by Dr. N. Ferrara (Genentech, South San Francisco, CA). After incubation, cells were washed three times in PBS containing carrier protein, and radioactivity was measured with a gamma counter (Beckman). As a positive control for VEGF binding we used murine 3T3 fibroblasts overexpressing human Flt-1 receptor (provided by Dr. Shibuya) (24). To provide larger numbers of cells for the Scatchard analysis, in some experiments CD34+ from several donors were pooled. Data were analyzed according to Scatchard’s procedure (25). 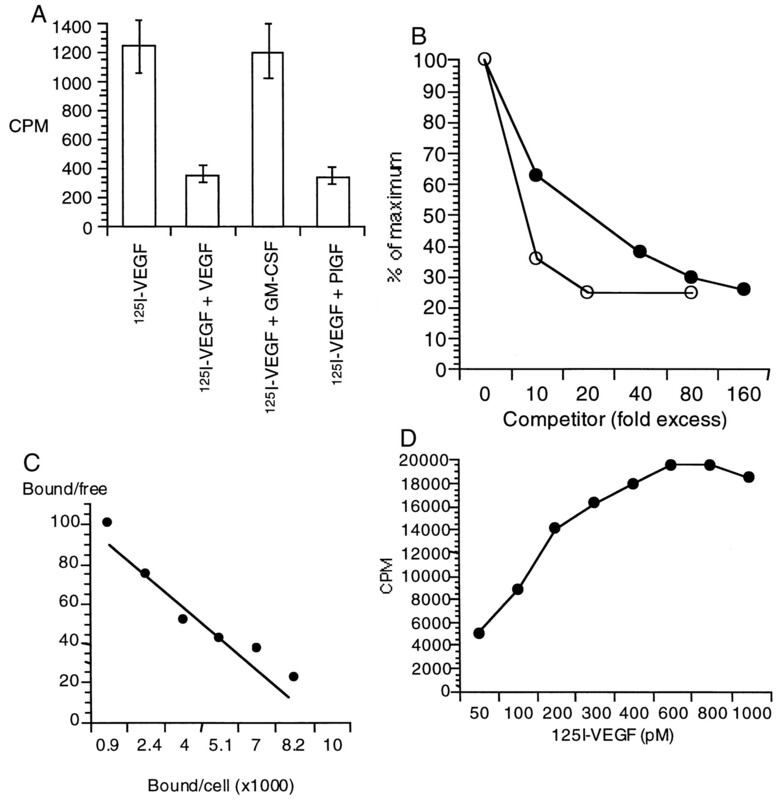 The cold competition assay was performed by incubating cells with a fixed concentration (500 pM) [125I]VEGF and increased concentrations of unlabeled ligand. Two constructs with the luciferase reporter gene under NF-κB-dependent promoters were used. The HIV-Luc construct places the HindIII/XhoI fragment of pHIVlacZ (26) into the HindIII/XhoI sites of pGL2-Basic (Promega Corp., Madison, WI). The 2×IFN-γtkLuc construct was made by placing an oligonucleotide bearing two tandem copies of the IFN-γ binding site (27) (5′-GAGACTTAAAAGGGATTTATGAATTTTCCAAAA-3′) containing HindIII linkers at either end for insertion into the HindIII site of pGL2-Basic. Both constructs were confirmed by sequence analysis before use. Cells (4–5 × 105) were collected after 5 to 6 days in culture with GM-CSF and TNF-α, washed in serum-free medium (OptiMEM, Life Technologies), and transfected in duplicate with 2 μg of plasmid DNA using the liposome Lipofectamine reagent (Life Technologies) in serum-free medium. Cells were collected 36 h after transfection and lysed with Triton/glycylglycine lysis buffer. The luciferase activity in cell lysates was measured as previously described (28) in the presence of d-luciferin (Sigma Chemical Co.) and ATP (Sigma) on a Monolight 2010 luminometer (Analytical Luminescence Laboratory, San Diego, CA). Double-stranded oligonucleotide probes were prepared by annealing the appropriate single-stranded oligonucleotides at 65°C for 10 min in 10 mM Tris, 1 mM EDTA, and 10 mM NaCl followed by slow cooling to room temperature. The probes were end labeled with 32P-labeled CTP by filling in 5′ overhangs with the Klenow fragment. We used the following κB probes (29): normal, 5′-GATCCAACGGCAGGGGAATTCCCCTCTCCTTA GTTGCCGTCCCCTTAAGGGGAGAGGAATCTAG; and mutant, 5′-GATCCAACGGCAGATCTATTCCCCTCTCCTTA GTTGCCGTCTAGATAAGGGGAGAGGAATCTAG. Nuclear extract was obtained from the cells as previously described (30). Ten micrograms of nuclear extract was incubated for 20 min with labeled probe (50,000 cpm) in the presence of 4 μg of poly(dI-dC) (Pharmacia, Piscataway, NJ) in binding buffer (20 mM HEPES, 5% glycerol, 0.2 mM EDTA, 1 mM DTT, and 5 mM MgCl2). Competition assays were performed with a 200-fold excess of unlabeled probes. The DNA-protein complexes were separated on 4% polyacrylamide gels, and visualized and analyzed on a PhosphorImager (Molecular Dynamics, Sunnyvale, CA). To block NF-κB, we used a dominant negative inhibitor IκBα with deleted serine phosphorylation sites. This prevents the dissociation of IκBα from NF-κB and subsequent activation of transcription. pAC, JM17, and Adeno-β-gal were gifts from Dr. Newgard (31). pAC-IκB-αΔN was constructed by ligating the 0.9-kbp Acc651 fragment of pBS(SK-)-IκB-αΔN into the unique Acc651 site of pAC. The construct was confirmed by restriction endonuclease digestion and sequence analysis over the start site of transcription. Human 293 cells were maintained on gelatinized tissue culture plates in DMEM containing 10% FBS (non-heat inactivated) and antibiotics at 37°C in 5% CO2. A subconfluent culture of cells (6 × 105 cells/60-mm dish) were transfected by calcium phosphate precipitation of pAC expression construct (10 μg) and JM17 (10 μg). Medium was replaced once weekly, and plaque formation was observed between 2 and 4 wk post-transfection. A subconfluent (80%) culture of 293 cells was infected with 10 to 100 μl of conditioned medium from picked plaques. Thirty-six hours postinfection, the medium was removed, cells were lysed, DNA was extracted from lysates, and the construct was verified by Southern blot analysis. Virus was precipitated from cell lysates using 0.5 vol of 20% polyethylene glycol 8000 (Sigma)/2.5 M NaCl on ice for 18 h and ultracentrifuged on CsCl gradient. The adenovirus band was purified on PD-10 Sephadex column (Pharmacia). The resulting virus-containing fractions were stored at −80°C. Two independently confirmed clones of the construct were produced, and protein production was verified by Western blot analysis. CD34+ cells were transduced at a multiplicity of infection of 100 by recombinant adenovirus (Ad-IκBα-ΔN or Ad-β-gal) on day 0, 3, or 6 after the start of the culture with GM-CSF and TNF-α. Cells were cultured as described above, with medium replaced on days 5 and 10. On day 14 cells were harvested, washed, and tested in functional studies or for expression of surface molecules. To assess the efficiency of transduction, 48 h after infection the β-gal activity in the cells was determined using standard X-gal assays (32). Cells generated from CD34+ progenitor cells with GM-CSF and TNF-α in the presence of VEGF, PlGF, Ad-IκBα-ΔN, or Ad-β-gal were irradiated (20 Gy) and incubated in triplicate with control allogeneic T cells at different ratios for 5 days. [3H]thymidine incorporation over 18 h was counted using a liquid scintillation counter (Beckman). RNA was isolated from cells using the GlassMAX RNA microisolation spin cartridge system (Life Technologies). Traces of DNA were removed by treatment with DNase I. cDNA was synthesized from 1 μg of total RNA by using random hexamers as primers and Superscript II reverse transcriptase (Life Technologies) according to the protocol provided by the manufacturer. The cDNA was subjected to PCR initial denaturation of 94°C for 2 min; 34 cycles of 94°C for 30 s, 55°C for 30 s, and 72°C for 45 s; and a final extension at 72°C for 2 min. PCR products were transferred to Hybond-N+ membrane (Amersham, Arlington Heights, IL) using standard alkaline transfer Southern blot techniques. Membranes were hybridized with 32P-labeled internal probes. Results were visualized and quantitated on a PhosphorImager. β-Actin primers and probes were used in every experiment in parallel to NF-κB-specific primers for standardization. Expression of the mRNA for each gene was normalized to the level of β-actin expression in the same sample using the formula: gene expression/β-actin expression × 100. PCR primer pairs for NF-κB subunits were selected so that the products had minimal homology with known family members to assure specific results for each NF-κB subunit. PCR primers pairs and internal probes were as follow: Flt-1: sense, 5′-AATTCCACCATGGTCAGCTA; antisense, 5′-AATTCATGCTCAGCCTTTCG; probe, 5′-AAGGCACCCAGCACATCATG; relB: sense, 5′-GAAGAACCATCAGGAAGTAGAC; antisense, 5′-GGTGAGCCGCTGCAGGAAGACG; probe, 5′-TGACAAGAAATCCACAAACACATC; c-rel: sense, 5′-GAGGGGAATGCGTTTTAGATACAA; antisense, 5′-CAGGAGGAAGAGCAGTCGTCAAAT; probe, 5′-CCAGGGGAGCACAGCACAGA; p50: sense, 5′-ACCCGCGGGCGTCTAAAA; antisense, 5′-AGCCGCTGCCTCTGAAGTT; probe, 5′-AGAAACAGCTGATGGCCCCTACCT; and β-actin: sense, 5′-TCACCCACACTGTGCCCATCTACGA; antisense, 5′-CAGCGGAACCGCTCATTGCCAATGG; probe, 5′-ATGCCCTCCCCCATGCCATCTGCGT. Previously, we and others reported the presence of mRNA for one (9, 16) or both (15) VEGF receptors (Flt-1 and KDR) in CD34+ cells. Here, we assayed for specific VEGF binding to freshly isolated CD34+ cells and to the cells during the process of DC maturation in vitro. Low but clearly specific VEGF binding to CD34+ cells was observed (Fig. 1⇓A). This effect was reproduced in five independently performed experiments. These results were confirmed in experiments with CD34+ isolated from umbilical cord blood using a flow cell sorter to a purity of >99% (data not shown). This binding was blocked by unlabeled VEGF and PlGF, but not by GM-CSF, as expected for binding to the Flt-1 receptor. Under the conditions used, the 125I-labeled VEGF binding was competed by unlabeled VEGF more efficiently than unlabeled PlGF (Fig. 1⇓B), consistent with reports that VEGF binds FLT-1 with higher affinity than PlGF (33, 34). Scatchard analysis performed using pooled CD34+ cells from several donors indicated that the Kd for the binding of VEGF to CD34+ cells was about 96 pM, with approximately 9,000 receptors/cell (Fig. 1⇓C). Binding reached saturation at a VEGF concentration of about 600 pM (Fig. 1⇓D). The ability of cells to specifically bind VEGF diminished with time in culture as cells progressed toward mature DC (Fig. 2⇓A), consistent with the observed effects of VEGF early, but not late, in maturation. The number of VEGF binding sites per cell decreased from 8800 on day 0 to 2100 on day 6 and 1500 on day 12. 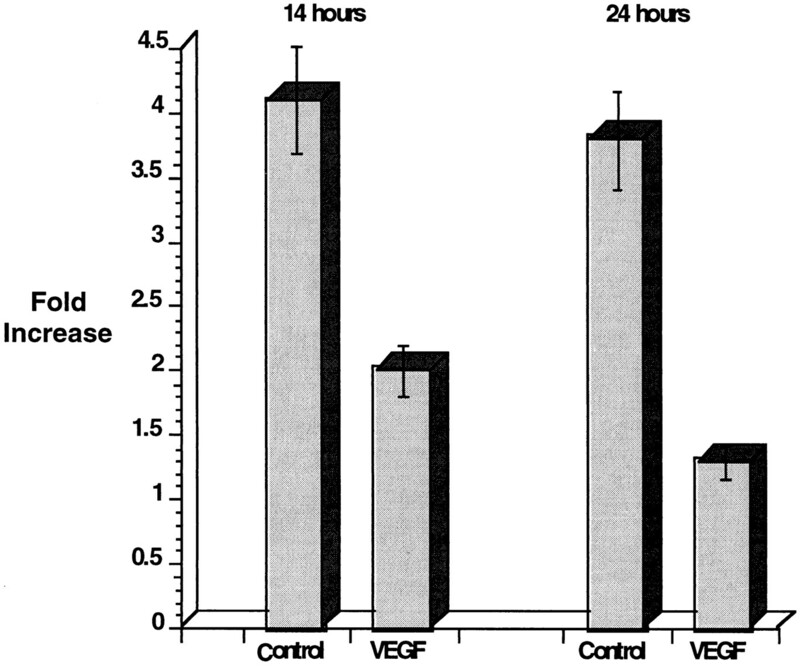 The Kd for VEGF binding on days 6 and 12 was unchanged from that observed on day 0. Thus, the decreased VEGF binding was due to a decrease in the number of specific receptors and not to a decrease in affinity. Negligible levels of specific VEGF binding were observed in DC generated from peripheral blood (data not shown). This decrease in binding was closely associated with a decrease in the level of Flt-1 mRNA (Fig. 2⇓B). It has been reported that TNF-α can directly inhibit Flt-1 expression in endothelial cells (35). Since our cultures contain TNF-α, we wanted to determine whether this factor alone was responsible for the loss of receptors with maturation. Therefore, we measured specific VEGF binding when HPC were grown in the presence of IL-4, another cytokine capable of supporting DC differentiation, rather than TNF-α. Both culture conditions resulted in substantial decreases in Flt-1 mRNA expression by days 7 and 11 (Fig. 2⇓B). VEGF specifically binds to hemopoietic progenitor cells. A, Specific binding of VEGF to CD34+ cells. CD34+ cells (3 × 105) isolated from cord blood as described in Materials and Methods were incubated for 6 h at 4°C in duplicate with 600 pM 125I-labeled VEGF in the presence of a 100-fold excess of unlabeled VEGF, PlGF, or GM-CSF. Typical results from one of five experiments are presented. Radioactivity in counts per minute per 105 cells is shown. B, PlGF and VEGF effectively block binding of [125I]VEGF to CD34+ cells. CD34+ cells were incubated with 500 pM [125I]VEGF in the presence of increasing concentrations of unlabeled VEGF or PlGF. The percent inhibition of binding is shown. Two experiments with the same results were performed. Open circles indicate unlabeled VEGF; closed circles indicate PlGF. C, Scatchard analysis of VEGF binding to CD34+ cells. One of three experiments with similar results is shown. Kd = 90 pM; 8800 receptors/cell. D, VEGF binding to CD34+ cells. Cells (106) were incubated in duplicate with increasing concentrations of [125I]VEGF as described above. Radioactivity in counts per minute per 106 cells is shown. VEGF binding decrease during the process of DC maturation. A, Specific VEGF binding decreased during the culture in vitro. CD34+ cells were cultured with GM-CSF and TNF-α. Binding of 800 pM VEGF was measured in duplicate on days 0, 7, and 14 after the start of the culture. Specific VEGF binding is shown. The typical results of one of three experiments are shown. * indicates a statistically significant difference from the control (p < 0.05). Radioactivity in counts per minute per 105 cells is shown. B, Expression of Flt-1 mRNA in cells during DC maturation. Flt-1 mRNA was measured at different times during DC maturation from HPC. Cells were cultured with GM-CSF and either IL-4 or TNF-α. The level of Flt-1 mRNA was normalized for β-actin mRNA from the same samples using the formula: Flt-1 mRNA/β-actin mRNA × 100. Typical results from one of four experiments are shown. Since PlGF was able to block VEGF binding to CD34+ cells, we analyzed the biologic effects of PlGF on DC maturation in vitro. We compared the effects of PlGF and VEGF on the ability of DC generated from HPC in the presence of GM-CSF and TNF-α to stimulate allogeneic T cell proliferation. 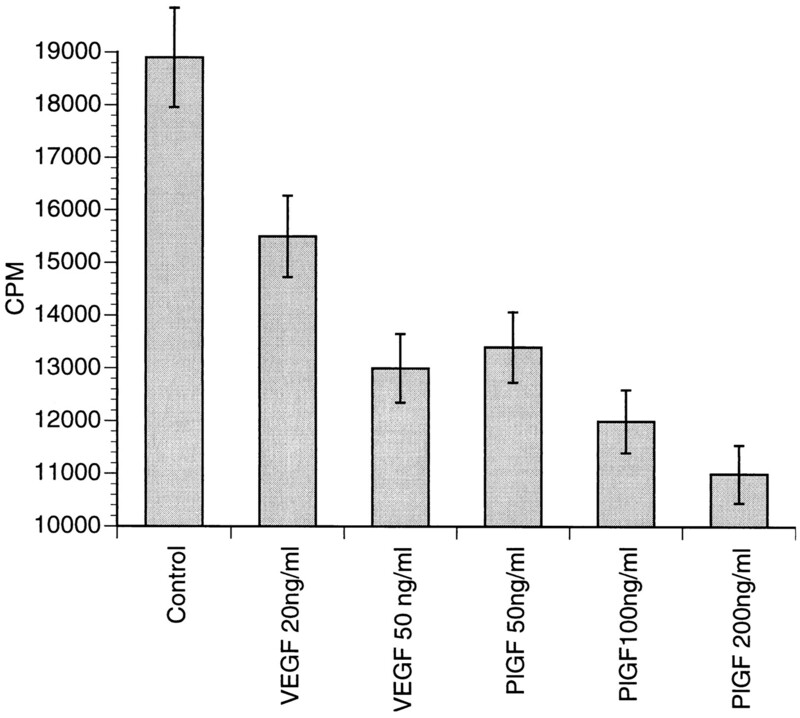 PlGF was associated with similar decreases in proliferation in this experimental system (Fig. 3⇓). Effect of PlGF on DC maturation in vitro. CD34+ cells were cultured with GM-CSF and TNF-α in the presence of various concentrations of VEGF and PlGF. The ability of DC to stimulate allogeneic T cell proliferation was measured on day 13 as described in Materials and Methods. Results for a DC:T cell ratio of 1:100 are shown. We have previously shown that the presence of TCS affected DC maturation if present during the first 4 to 5 days in culture (9). We therefore hypothesized that if there were any effect of TCS or VEGF on NF-κB activity it would be detectable at the end of this period. CD34+ cells were cultured with GM-CSF and either TNF-α or IL-4 for 5 to 6 days in the presence of TCS or VEGF. Cells were then collected, washed, and transfected with the κB enhancer reporter gene construct as described in Materials and Methods. 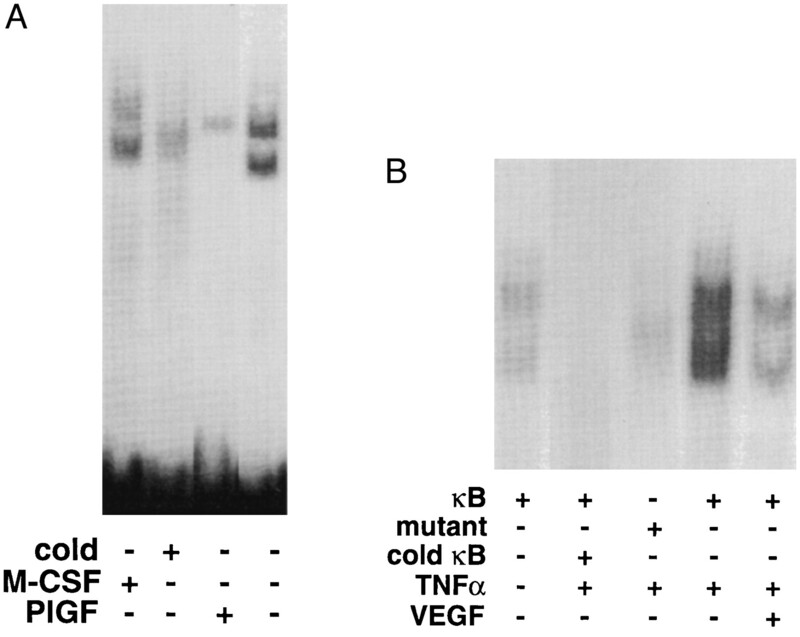 As shown in Figure 4⇓, TCS and VEGF significantly decreased κB-dependent transcription. This effect was observed in both experimental conditions (growth of HPCs with GM-CSF and either TNF-α or IL-4). However, the level of transcriptional activation in control cells cultured with GM-CSF and IL-4 was lower than that in the presence of TNF-α. This effect could be due to the fact that TNF-α is a potent activator of NF-κB, while IL-4 inhibits NF-κB activation in a number of systems (36, 37). Under both conditions, however, VEGF and TCS suppressed the observed activity. To confirm the trans-activation studies, we assessed sequence-specific binding of NF-κB to oligodeoxynucleotides in an electrophoretic mobility shift assay. As shown in Figure 5⇓, significantly decreased NF-κB-specific binding was observed in the presence of TCS or VEGF in cells after 7 days in culture. VEGF and TCS inhibit NF-κB activity. CD34+ cells were cultured with GM-CSF and TNF-α or IL-4 for 6 days in the presence of 20% TCS derived from tumor cell line HTB 132 or 50 ng/ml VEGF165. 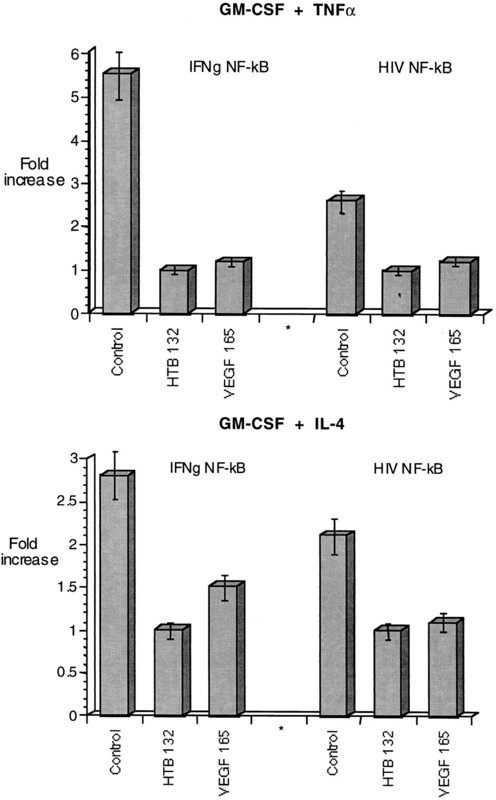 After this time, cells were washed and transfected in duplicate with two plasmids containing NF-κB-specific binding sequences derived from the IFN-γ or HIV promoters with luciferase reporter gene as described in Materials and Methods. Thirty-six hours after transfection, luciferase activity was detected and adjusted for protein concentration. The fold increase over the background level of nontransfected cells is presented. The results of one of five experiments are shown. TCS and VEGF inhibit specific NF-κB binding to DNA. CD34+ cells were cultured with GM-CSF and TNF-α for 6 days (A) or 7 days (B) in the presence of 20% TCS (HTB 131) or 50 ng/ml VEGF. EMSA was performed as described in Materials and Methods. Typical results from two of four experiments are shown. Jurkat cells were used in the experiment shown to demonstrate the specificity of the binding. κB, NF-κB-specific probe; mutant, probe with mutant (nonbinding) sequence. We then attempted to determine whether the alterations in NF-κB activity occur during the first few days of culture, when these cells are most responsive to TCS (9). CD34+ cells were incubated with GM-CSF and TNF-α in the presence of VEGF. Cells were transfected after different times with a luciferase reporter plasmid containing the NF-κB-specific promoter from IFN-γ. Fourteen hours after the start of culture, control cells had substantial levels of reporter gene transcription, and VEGF significantly decreased the observed activity (Fig. 6⇓). VEGF and PlGF, but not M-CSF, resulted in decreased specific binding of NF-κB to DNA as early as 30 min after treatment with TNF-α (Fig. 7⇓). These data suggest that Flt-1-mediated inhibition affects very early signaling events. VEGF suppresses NF-κB activity during the first 24 h in culture. CD34+ cells (5 × 105) were cultured with GM-CSF and TNF-α in the presence of 50 ng/ml VEGF165. The cells were then transfected in duplicate with plasmids containing the luciferase reporter gene under control of the NF-κB-specific promoter from IFN-γ 14 or 24 h after the start of culture. Luciferase activity was measured 36 h later as described in Materials and Methods. Two experiments with identical results were performed. VEGF and PlGF decrease sequence-specific binding of NF-κB 30 min after stimulation with TNF-α. CD34+ cells were cultured with GM-CSF for 18 h. After that time TNF-α (5 ng/ml) was added alone or together with VEGF (100 ng/ml), PlGF (200 ng/ml), or M-CSF (20 ng/ml). VEGF, PlGF, and M-CSF were added 10 min before TNF-α. Nucleoprotein was extracted 30 min later. EMSA was performed as described in Materials and Methods. Four experiments with similar results were performed. A, Cells were treated with TNF-α and PlGF or M-CSF for 30 min. B, Cells were treated with TNF-α and VEGF for 30 min. The data presented above indicate that defective DC maturation induced by TCS and VEGF is associated with a decrease in NF-κB activity. To independently confirm the hypothesis that NF-κB plays an important role in causing the observed effects of VEGF on DC differentiation, we used a transdominant inhibitor of NF-κB, IκBα-ΔN. This NF-κB inhibitor has deleted critical serine phosphorylation sites and therefore is not degraded in response to physiologic stimuli that normally activate nuclear translocation of NF-κB. Thus, NF-κB-specific transcription is constitutively inhibited. 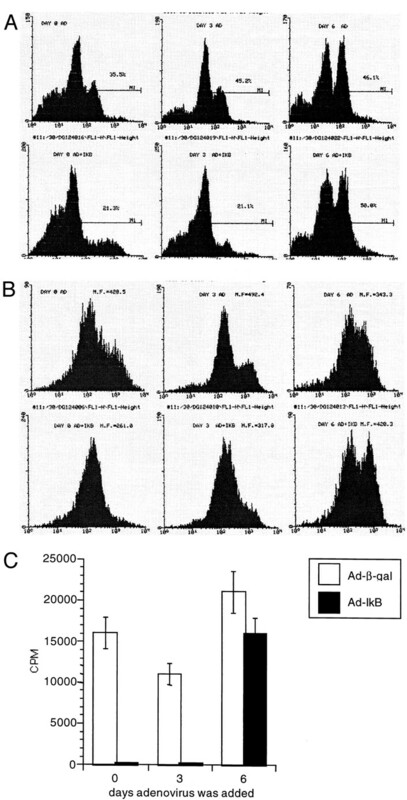 CD34+ cells were transduced with an adenovirus expressing IκB-ΔN (Ad-IκBα-ΔN) or a control virus (Ad-β-gal) on days 0, 3, and 6 after the start of the culture. Cells were cultured in CCM supplemented with GM-CSF and TNF-α. Medium was replaced on days 6 and 10. Cells were cultured for a total of 14 days and were analyzed simultaneously. Adenovirus (100 multiplicity of infection) had no affect on cell viability (data not shown). The efficiency of transduction was tested using staining for β-gal activity. Forty-eight hours after infection, 40 to 50% of the cells in all samples were positive for X-gal staining, indicating that approximately half the cell population was infected and expressing the β-gal gene product. The total cell number was the same in all paired samples. No significant differences were seen in the morphology of the cells using light microscopy. However, the percentage of cells expressing one of the DC-associated markers, CD1a, was decreased from 35.5 to 21.3% (14.2% difference) in CD34+ cells infected with IκBα-ΔN on day 0. This difference was greater (45.2 vs 21.1 and 24.1%) if cells were transduced with IκBα-ΔN on day 3. No effect was seen if cells were infected on day 6 (Fig. 8⇓A). It should be noted that the percentage of CD1a+ cells generated from HPC in the presence of the control adenovirus on day 0 was lower than that seen when the virus was added on day 3 or day 6. This may reflect a nonspecific effect of adenovirus on HPCs. The same patterns were observed when expression of HLA DR on the cell surface was measured. The group of cells with high MHC class II expression was not seen in samples with IκBαΔN transduction on days 0 and 3, whereas no differences were registered if transduction was performed on day 6 (Fig. 8⇓B). 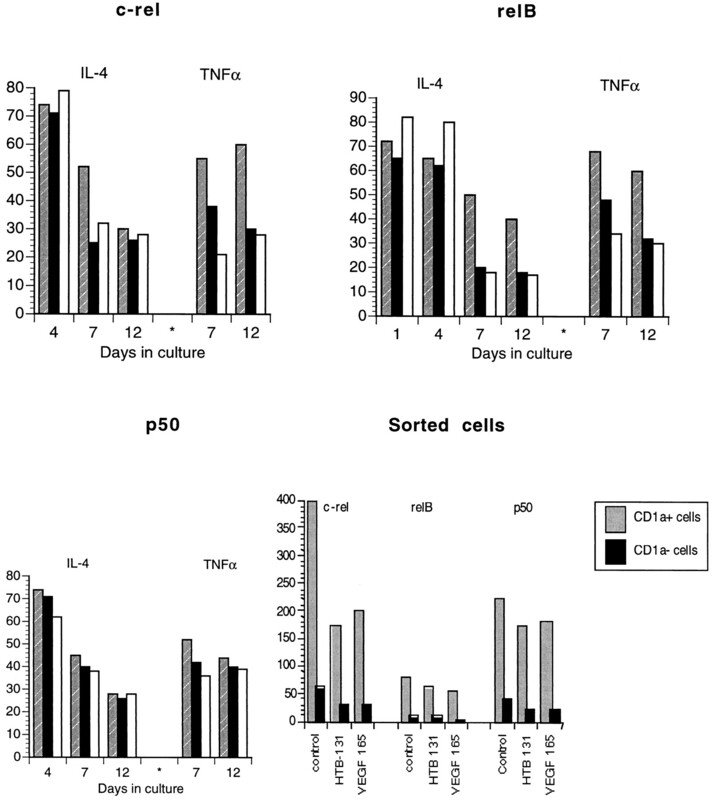 Cells cultured in the presence of the NF-κB inhibitor from days 0 and 3 were unable to stimulate control allogeneic T cells, whereas cells cultured with IκBα-ΔN from day 6 stimulated T cells at approximately control levels (Fig. 8⇓C). These effects parallel those observed with TCS or VEGF, suggesting that NF-κB may be the mediator of the observed effects. Effect of blockade of NF-κB on DC maturation in vitro. CD34+ cells were transduced with the recombinant adenovirus containing a dominant negative IκBαΔN (AD+IκB) and with a control adenovirus with the same structure without IκBα (AD). Three groups of cells were used (transduced on days 0, 3, and 6). Cells were cultured with GM-CSF and TNF-α, collected on day 14, and analyzed on a FACScan flow cytometer. Dead cells were excluded from analysis by staining with 7AAD. A, Cells labeled with anti-CD1a-FITC Ab. The selected regions were set based on the level of nonspecific binding of FITC-conjugated mouse IgG Ab. B, Cells labeled with HLA-DR-FITC Ab. M.F., mean of fluorescence. Two experiments with the same results were performed. The level of nonspecific binding of isotype control Ab was less than 101. C, Cells collected on day 14 were irradiated and cultured at a ratio of 1:100 with control allogeneic T cells for 5 days in triplicate. 3H uptake is shown. The background of spontaneous T cell proliferation was subtracted. Identical results were obtained in two experiments. We then asked whether VEGF can directly block transcription of the subunits of NF-κB. RNA was collected from cells cultured with GM-CSF and either TNF-α or IL-4 on days 1, 4, 7, and 12. Expression of mRNA for three subunits of NF-κB (c-rel, RelB, and p50) was studied. As shown in Figure 9⇓, no decrease in mRNA expression for any of these subunits in the presence of TCS or VEGF was observed during the first 4 days of culture. However, on days 7 and 12, mRNA levels for c-rel and relB, but not for p50, were only half those in control cultures in the presence of TCS or VEGF. This observation was seen mostly in cells cultured with TNF-α. The presence of IL-4 in cell culture significantly decreased the level of NF-κB mRNA expression in control samples by day 12, and the effect of VEGF or TCS was observed only for RelB. We then attempted to determine whether this decrease was associated with all cells or only with the subpopulation of immature cells that appeared in the presence of TCS or VEGF. Cells were cultured for 14 days with GM-CSF and TNF-α in the presence of TCS or VEGF. After that time, cells were labeled with anti-CD1a Ab, a molecule expressed on mature DC and Langerhans cells. CD1a+ cells were separated from CD1a− cells, and the level of mRNA for NF-κB subunits was measured in each group of cells. As shown in Figure 7⇑, mature DC expressed more than sixfold higher levels of mRNA for c-rel, relB, and p50 than CD1a− cells. When CD1a+ DC generated in the presence of TCS or VEGF were compared with those from control samples, no differences in the level of mRNA for p50 and relB was found, indicating that the majority of the observed decrease in the bulk population was due to a shift of cells from the CD1a+ group to the CD1a− group. However, an almost twofold decrease was still observed in the level of c-rel mRNA. Transcription of NF-κB subunits during DC maturation in vitro. CD34+ were cultured with GM-CSF and either TNF-α or IL-4 alone (gray column) or in the presence of TCS, HTB131 (black column), or 50 ng/ml VEGF (white column). Relative mRNA levels for c-Rel, RelB, and p50 normalized for β-actin are presented on the vertical axes. Typical results from one of three independent experiments is shown. Sorted cells indicate CD34+ cells cultured with GM-CSF and TNF-α for 14 days in the presence of TCS (HTB-131) or VEGF (VEGF 165), collected, washed, and sorted as described in Materials and Methods, using anti-CD1a-FITC Ab. The typical results from one of three experiments are shown. In this study we have examined the mechanisms involved in defective DC maturation in cancer. As we have reported previously, tumor-derived factors act directly on hemopoietic progenitor cells to dramatically inhibit DC maturation and result in the generation of immature cells (9). These cells belong to the myeloid lineage, and our preliminary studies indicate that these cells are most likely to be maturation-arrested DC (data not shown). Blockade of VEGF activity using a neutralizing Ab completely abrogated the effect of TCS on DC maturation from HPC (9), and treatment of CD34+ cells with recombinant VEGF alone reproduced the ability of TCS to decrease the uptake of soluble Ag and the stimulation of allogeneic MLR by DC. Regulation of the ability of HPCs to differentiate into DC by tumor-derived VEGF is a potentially very important phenomenon by itself, but VEGF and PlGF may also play a broader role than this and be involved in the regulation of other hemopoietic lineages both in tumor-bearing hosts and during normal development. Indeed, other reports have demonstrated the negative effect of VEGF on the growth of myeloid and erythroid colonies in vitro (13, 14). Here, we investigated the nature of VEGF-mediated signaling in hemopoietic progenitor cells and identified one molecular pathway involved in its effect on DC maturation. We first demonstrated specific binding of VEGF to freshly isolated CD34+ cells. Two high affinity tyrosine kinase receptors for VEGF have been previously described on endothelial cells: Flt-1 and KDR (38, 39). Different signal transduction properties have been reported for these two receptors (33). FLT-1 has been reported to have a higher affinity for VEGF than KDR (Kd values of 10–20 and 760–770 pM, respectively) (33). We have been able to detect only mRNA for Flt-1 in HPC, though others have reported that they express mRNA for KDR. To identify the functional receptor for VEGF on CD34+ cells, we used competition with PlGF. PlGF has been recently described as a growth factor with strong homology to VEGF and to be capable of forming functional heterodimers with VEGF. PlGF is able to bind to Flt-1, but not to KDR (34, 40). In our experiments PlGF effectively competed for specific VEGF binding sites on CD34+ cells. This indicates that VEGF binds to CD34+ cells via the Flt-1 receptor. Interestingly, Flt-1, but not KDR, has been identified as the VEGF receptor on monocytes that mediates the activities of VEGF on the chemotactic and procoagulant activities of these cells (41, 42). In direct experiments, cells cultured with GM-CSF and TNF-α in the presence of PlGF demonstrated reduced ability to stimulate control allogeneic T cells compared with control cells. These data confirm that signals mediated by Flt-1 are responsible for the observed defective functional maturation of DC from progenitor cells. TCS containing VEGF do not, however, affect the function of mature DC isolated from peripheral blood (9). In this study we have demonstrated that the effect of TCS is closely related to the expression of VEGF receptors on the cells. We have shown that specific VEGF binding decreases dramatically with time in culture and progressive maturation. It was very low on day 7 and almost undetectable on day 14 and on mature DC generated from peripheral blood, closely associated with decreased Flt-1 mRNA levels. The percentage of CD34+ cells in culture also drops dramatically by day 7 (9, 43). Thus, only HPC, but not mature DC, have the ability to bind VEGF. We then sought to establish the signal transduction and transcriptional activation mechanisms altered by Flt-1 signaling in HPCs. The transcription factor NF-κB is involved in regulation of many genes responsible for cell activation; immune, inflammatory, and cytokine responses; cell adhesion; and growth control (for review, see Refs. 44 and 45). One of the NF-κB subunits, RelB, has been directly implicated in DC function, as relB knockout mice have no mature DC (21). In knockout mice, however, all somatic cells lack the gene throughout development, and the function of NF-κB in postnatal HPCs and the signals controlling its activity were undefined. RelB and other members of the NF-κB family, p65 (RelA), p52, p50, and c-Rel, are expressed in normal bone marrow-derived DC and in follicular dendritic cells (46, 47). We therefore hypothesized that NF-κB might be the transcription factor most responsible for the observed effects of VEGF on DC maturation. In our experiments, TCS and VEGF blocked the ability of NF-κB to activate transcription and to specifically bind DNA, consistent with our hypothesis that the effects of VEGF may be mediated by reduced NF-κB activity. To independently confirm this, we blocked NF-κB activity directly in HPCs under our culture conditions using a transdominant inhibitor of NF-κB, IκBα-ΔN. Transduction of CD34+ cells with Ad-IκBα-ΔN on days 0 and 3 after the start of culture with GM-CSF and TNF-α dramatically affected DC maturation in a manner indistinguishable from that observed with TCS. This effect was not observed when IκBα-ΔN was transduced 6 days after the start of the culture, in agreement with our previous data with TCS. This demonstrates that the first 4 to 5 days of culture are a critical period in which NF-κB function is required for normal DC development, and exposure to VEGF during this period can block it. This time (6–7 days in culture) is also critical for the appearance of intermediate cell-type cells that have the potential to differentiate into either DC or macrophages depending on the culture conditions (48, 49). After 6 to 7 days in culture with GM-CSF and TNF-α, DC precursors do not proliferate but, rather, differentiate into mature DC (48), and DC maturation appears to be less dependent on NF-κB. The initial activation of NF-κB does not require protein synthesis de novo (50). However, maintenance of NF-κB activity requires protein synthesis and continuous stimulation, suggesting that regulation also occurs transcriptionally (51). Since CD34+ cells were cultured with TNF-α and GM-CSF, known stimulators of NF-κB, we also studied the possibility that VEGF may directly inhibit transcription of NF-κB and hence result in reduced activity. However, no effect of TCS or VEGF on the level of NF-κB transcription was observed during the first 4 days in culture, while NF-κB activity was significantly decreased as early as 14 h after the start of culture with VEGF. A decreased ability of NF-κB to bind to specific DNA sequences was detected as early as 30 min after stimulation with TNF-α in the presence of VEGF or PlGF (Fig. 7⇑). Significant decreases in mRNA for relB and c-rel were observed only after day 7, suggesting that transcriptional changes were secondary to the effects occurring during the first 5 to 6 days in culture. It is interesting also that NF-κB activity was closely associated with relatively mature DC. The level of mRNA for all three studied member of the NF-κB family (c-rel, relB, and p50) was dramatically higher (six- to sevenfold) in mature DC than in other cells in the final culture. The precise chain of events leading to defective NF-κB function after exposure of HPC to VEGF is not clear. It is possible that VEGF signaling through the Flt-1 receptor may directly inhibit the dissociation of NF-κB from IκB in the cytoplasm. Recently, it has been reported that site-specific tyrosine phosphorylation of IκBα may inhibit its inducible serine phosphorylation and degradation, preventing translocation of NF-κB to the nucleus (52). Since NF-κB is positively autoregulated after cell stimulation (53, 54), sequestration of NF-κB in the cytoplasm may result in lower levels of transcription in the presence of VEGF, as observed in our experiments. Further studies are needed to test these hypotheses. As we reported previously and demonstrated here, treatment with VEGF or PLGF alone induces about a 45% decrease in the function of DC generated from progenitors. Treatment with the dominant inhibitor results in a more dramatic effect. PLGF or VEGF are likely to work through complex pathways involving many unknown factors, and their effects are less profound that direct blockade of NF-κB by the dominant inhibitor IκBΔN. Finally, in this study we for the first time demonstrated that VEGF specifically binds to Flt-1 receptors on the surface of HPC and that this leads to inhibition of NF-κB activity and to a defect in DC maturation. We also for the first time have shown that NF-κB is directly involved in the early stages of DC maturation from hemopoietic progenitor cells. Thus, tumor-derived soluble factors, including VEGF, may affect the function of professional APC that may, in turn, result in a decreased ability of the immune system to generate effective antitumor immune responses. We thank Drs. Ferrara and Shibuya for providing us with the reagents and cells needed to perform these studies, and Dr. J. Price for help with cell sorting. ↵1 This work was supported by National Institutes of Health Grant CA61242 (to D.C.). ↵3 Abbreviations used in this paper: DC, dendritic cells; VEGF, vascular endothelial growth factor; HPC, hemopoietic progenitor cell; NF-κB, nuclear factor-κB; IκB, inhibitory protein-κB; CCM, complete culture medium; GM-CSF, granulocyte-macrophage CSF; TCS, tumor cell supernatants; bright, strongly expressed; PlGF, placenta growth factor; EMSA, electrophoretic mobility shift assay; Ad-β-gal, adenovirus-β-galactosidase; M-CSF, macrophage CSF. F. M. Ausubel, and R. Brent, and R. E. Kingston, and D. D. Moore, and J. G. Seidman, and J. A. Smith, and K. Struhl, and L. M. Albright, and D. M. Coen, and A. Varki, and V. B. Chandra, eds. Current Protocols in Molecular Biology 1996 John Wiley & Sons, Inc, New York.